I have done it! I have finally found a werewolf book that trumps all others (at least thus far). There have been numerous series that I have enjoyed, such as The Wolves of Mercy Falls by Maggie Stiefvater or Nightshade by Andrea Cremer, but this book stands alone. The storyline and plot is complex, engaging, and addicting, and the writing is both simple and lush. This is a wonderful story that you should not miss out on! The thing that I liked the most about this book and really set it apart from others of its kind was how well the ‘personality’ of the wolf came to life. Barnes meshes the human and wolf personalities flawlessly, leaving no dichotomy between them. When I think of werewolves, I always imagined them as one entity, both human and wolf living symbiotically in one body, and Barnes portrays them exactly this way. She truly captured the essence of the wolf, at times bringing it to the forefront of the story. The main character, Bryn, is a human that has been raised by wolves, and while she cannot actually change into a wolf, she thinks and feels like one. During intense emotional moments or memories, her wolf’s voice would come forward. Pack, pack, pack. Blood, blood, blood. Alpha, protect, mine, survive. I know this way of thinking/writing irked many people, but I did not equate these simple, repetitive sentences with Bryn, but rather with her wolf. Wolves process things using emotions and smell: the smell of blood brings about thoughts of survival and protection, the smell of dominance brings about thoughts of alpha and pack. By using these simple thoughts and sentences, Barnes brought the wolf personality of the werewolf forward. Very few books do that, so it was an inventive, refreshing take on werewolf stories that I really appreciated. I loved the characters, as well. Bryn is strong, and even though she is one of only two humans living amongst werewolves, she stands up to the alpha and just lives for pushing people’s werewolves’ buttons. She is smart beyond her years, and with the discovery of her ‘ability’ (which I will not reveal), she definitely proves to be an interesting character. Devon is the perfect best friend, protective and loyal, and his metrosexual-self provided many humorous moments. And Ali is an awesome mother! She is a new age Sarah Conner (with werewolf relations), and I loved how she stood against everyone, even her alpha and husband, to do what she thought was right. Callum also proved to be intriguing. I did not like him much at first, and I thought some of his judgment calls left a lot to be desired, but I ended up really liking him after everything was explained. Chase, the newly turned werewolf, creates some turbulence with his presence and knowledge of a Rabid werewolf. The reader does not learn that much about him, so I am hoping more will be revealed about him and the rest of the characters in the next book! I think that Chase and Bryn’s relationship was also well crafted. It does suffer from ‘instalove,’ but I think this instant connection between them was brought on by their wolves, not their human counterparts. Wolves connect to their mates rather quickly, with things such as smell and physical contact being triggers. 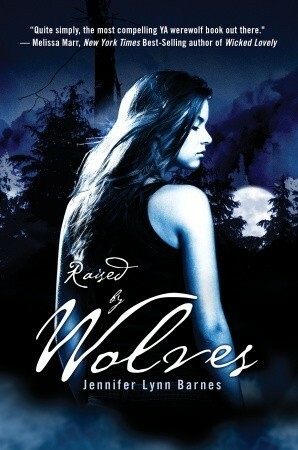 Callum warns Bryn not to touch Chase, but the moment she does, their wolves claim one another. With similar pasts, the same ‘ability,’ and the emotional pull between them, their wolves recognize each other as mates. The human side of Bryn remains unsure of how she feels about Chase throughout the book, but her wolf side has already claimed him as hers. Mine, mine. My Chase. I know that this ‘instalove’ and relationship between Chase and Bryn bothered many (especially one of my friends), but I did not mind it at all. This is just another way in which the wolf makes its presence known. While this book did start off a little slow, it quickly builds up. It drew me in and kept me captivated. The ending was nice, too. It ties almost everything up really well, while leaving a few things open for the sequel. Overall, this is definitely one of the better paranormal YA reads out there. The story is not tainted by a love triangle, a cliffhanger, or any (teenage) drama that does not pertain to the story/plot. The story is original and creative, and I enjoyed every page. I cannot wait to how things develop in the sequel, Trail by Fire. I will definitely be reading it!